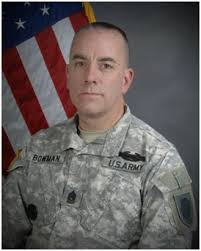 CSM Bowman enlisted in the Army in October 1979 as a tank driver. He attended basic training at Fort Knox, Kentucky. CSM Bowman served overseas in Germany for nearly four years. 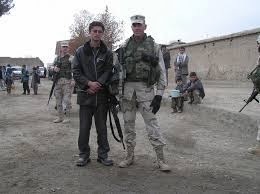 He deployed in support of Operation Enduring Freedom in Afghanistan in 2004 to 2005 and again with the 33rd IBCT as part of Task Force Phoenix in 2008 to 2009. CSM Bowman's military awards and decorations include the Combat Infantry Badge, Combat Action Badge, Bronze Star Medal (2nd Award), Army Commendation Medal (4th Award), Army Achievement Medal, Army Good Conduct Medal (2nd award), Army Reserve Component Achievement Medal (5th Award), National Defense Service Medal (2nd Award), Afghanistan Campaign Medal( 2nd star), Global War on Terrorism Service Medal, Armed Forces Reserve Medal (�M� and Silver Hourglass Devices and Numeral 2), NCO Professional Development Ribbon (Numeral 4), Army Service Ribbon, Overseas Service Ribbon (Numeral 3), Army Reserve Component Overseas Training Ribbon, NATO Medal (ISAF), Drivers Badge-Track, Drill Sergeant Identification Badge, German Marksmanship Badge (Bronze), French Military Defense Medal (Silver). Yeah, finally the right Soldier in the right job!